“In all the years the Bedouin lived in Petra there was not one foreign casualty in the area …” wrote Marguerite. The sun set. The beam of light reflected from a Wadi Musa rooftop went dark. “We must leave now,” advised Juomaa. We didn’t argue, nor insist on enjoying the after-sunset-drinks the young men at the café offered us. “Want to stay and party?” they grinned. Young, old, married or not, it never hurt to offer. Who knew? Maybe one or two ladies might be tempted to stay and raise glasses to the mountain djinns. Hungry, our donkey train was ready to return home for dinner. The breeze must have carried the scent of alfalfa. On the way down, going through the low tunnel, they would have cheerfully scrapped us off if Juomaa and Maaz had not held them steady. Fifty-rounds of “Jesus, Joseph and Mary” later, we landed on the empty Colonnade. Walking the length of the Colonnade, a few shop keepers shined their flashlights at us and called out an invitation for tea. A couple tourists wondered between the tented shops. The Treasury coffee shop was still open, but our impatient donkeys wanted to turn around. Juomaa enlisted the tea man’s help so we could get a night photo. Re-tracing our morning steps to the Siq’s entrance, we rode in pitch blackness, holding out our arms to push our donkeys away from the sandstone walls. 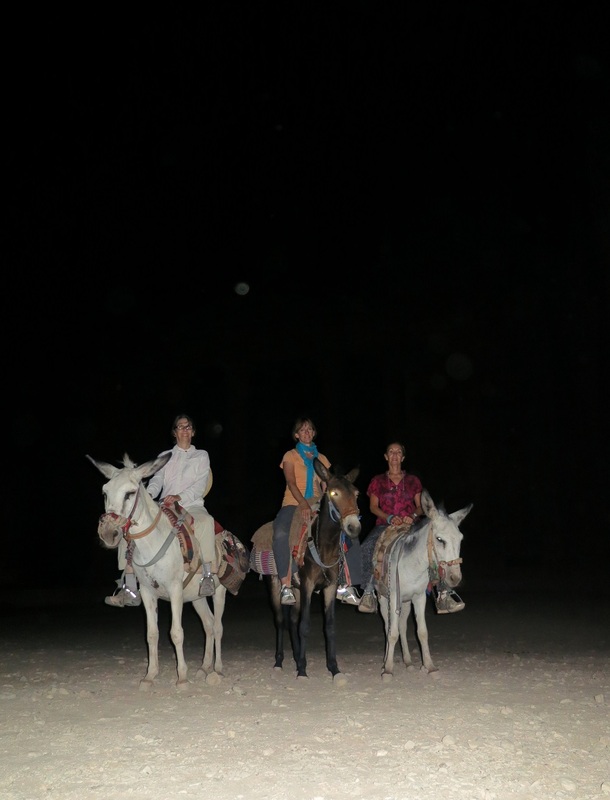 To navigate, Juomaa looked towards heaven and followed the star trail above the canyon walls. Not a soul shared the Siq. They had adjourned to the sky. It’s been said there are more angels than stars. If that night was an example, then their numbers cannot be imaged by humans. We could not get over our good fortune. The man at the ticket office was wrong about that Wednesday night. Someone had arranged with the Bedouin for us to see Petra. And the day ended when Juomaa and Maaz valeted our donkeys at the Movenpik’s front door.